With The Path of Most Resistance, his first new collection since the Scotiabank Giller Prize–shortlisted Whirl Away in 2012, Russell Wangersky affirms his position as one of the finest short-story writers currently working in this country. Following on the heels of his 2014 thriller, Walt, which was named one of the top crime books of the year by the National Post, and the earlier collection, which was also nominated for the BMO Winterset Award and won the Thomas Raddall Atlantic Fiction Award, Wangersky has delivered a collection unified in its quality, but eclectic and surprising in the breadth of its styles, subjects, and techniques. The title story takes an epistolary approach, written in the form of a letter from Nell to her longtime friend and lover, Sara. Nell has followed through on their dreams of escaping their unspecified hometown – of “finding the flowers we’d never see except in photographs and spotting the birds that only live in guidebooks” – while Sara has stayed behind. Sara has become involved in a relationship with Josh, while Nell settles, temporarily, in Mexico. Wangersky gracefully captures the delicate balancing act of Nell’s emotions: anger vying with confusion, longing, and love. The letter is an accusation, subtly threaded with the potential for forgiveness. It’s a finely crafted blend of understatedness and subtext. Other stories are broader, often humourous. “Snow,” for example, follows the rivalry of two retirees as they race to clear the fresh snow from their respective walks. In other cases, surface humour or surrealism reveal a deeper emotional core, as is the case in “Armenia,” in which a map of the titular country outlined in mould on a bathroom wall serves as a touchstone for Tom’s uncertainties about his relationship with the mysterious Ray. 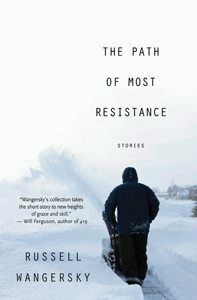 Wangersky writes with a tightly controlled eye for detail, a skill with description – both emotional and physical – that blossoms into a rare vitality. Nowhere is this more apparent than in “Bide Awhile,” the highlight of the collection. That story is a master class in the potential of fiction: a scathing examination of a marriage, a keen-eyed description of place, and a gradually ratcheting, ultimately excruciating exercise in suspense and tension. “Bide Awhile” will leave most readers – and likely most other writers – utterly devastated and in a state of awed wonder. One of the great strengths of The Path of Most Resistance is its variety, the sense that the reader never knows what the next story will bring. The great strength of Take Us To Your Chief, the new collection from Drew Hayden Taylor, is how resolutely it works within a single genre. Frustrated by repeated attempts to put together an anthology of aboriginal science fiction, Taylor decided he’d write the stories himself. Take Us to Your Chief immerses itself in the tropes and traditions of the genre filtered through a distinctly indigenous sensibility. Taylor’s approaches are largely drawn from golden age sci-fi – the stories of the 1940s and ’50s. The title story follows the appearance of a flying saucer, with an alien visitor assuring the humans it encounters, “We come in peace,” and requesting, “Will you take us to your leader, then?” That the spacecraft appears to Tarzan, Cheemo, and Teddy – three Ojibway men “enjoying a cooler stocked with beer that was chilling in the shallow waters near the shore” of Old Mans Point in Newfoundland – turns the conventions upon their heads, especially when one understands the implications of the story’s title. 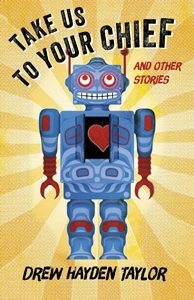 It’s a wry tale, which quickly becomes a commentary upon itself and upon the expectations of the reader, both in terms of science fiction and the representations of First Nations’ characters. Taylor attacks the material in Take Us to Your Chief with a delight that is readily apparent, and a genuine pleasure to read. At times the stories lack subtlety. “A Culturally Inappropriate Armageddon” kicks off the collection with an account of how C-RES, a “community radio station on the reserve,” contributes to the end of the world. The story works, though, precisely because of its broad humour, the way it lampoons the earnestness of the characters and their missions, and its knowing sense of its own absurdity. Similarly, “Dreams of Doom” is a conspiracy story with a twist that will cause most readers to guffaw outright. It’s not all light and funny, though. Threaded through the stories is a keen sense of displacement and cultural loss, and when those themes come to the fore, as they do in stories like “I Am … Am I,” “Mr. Gizmo,” and “Petropaths,” the results are powerful and thought-provoking, infusing the individual pieces with genuine weight and significance, a reminder of the enduring power of the rusty tropes with which Taylor is playing.